Age of Republic – General Grievous #1 takes a stab at the Separatist general by pitting him against some Jedi and a Jedi Temple. We are rewarded with a rare canon glimpse of what Grievous looked like before he became a cyborg, and a reminder that the Force cannot be destroyed with lasers. The issue begins on a planet called Ledeve as Grievous is chasing down a Jedi master and her padawan. He slays both of them and takes his trophies with the artwork indicating that this is perhaps where he picks up his fourth lightsaber. Regardless, the artwork does a great job with making Grievous look creepy as he roams through the forest and stalks the Jedi. He finds a Jedi Temple and makes his way past all the traps, showing off some of his skills as a cyborg. 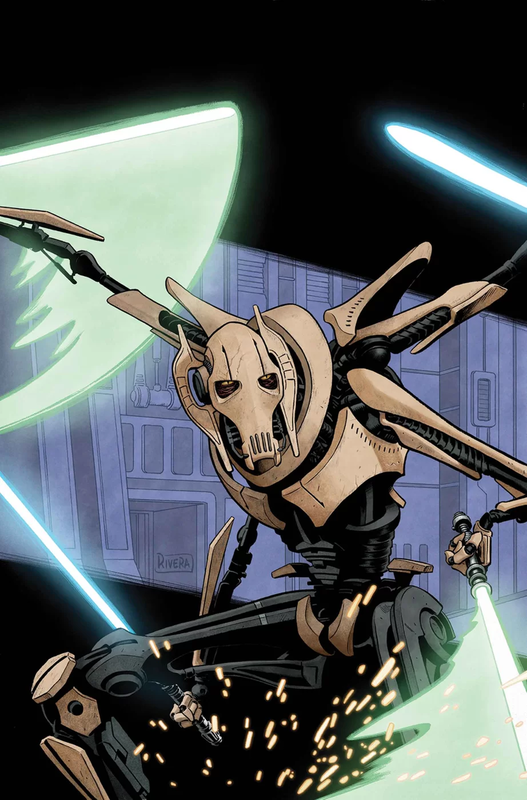 The comic also shows a glimpse of a statue of Grievous before he was a cyborg as the character remarks that he earned his unlike the Jedi statues before him. Eventually he finds a Force nexus and plunges into some ethereal Force realm where the Force, or some Jedi spirits, talk to him. They remind him of how few living parts he has and how that makes him small. The artwork goes so far as to once again show Grievous before he was a cyborg, now in full color rather than as a stone statue. One creepy panel shows the disembodied parts of what non-droid elements he has left. Angered by having this Force thing play with him, render him powerless, and belittle him with how small he is, Grievous wipes out the temple with an orbital bombardment. However, the last panel shows a glimmer of light, what remains of the Force nexus. Overall, I liked this issue. The artwork by Luke Ross and Java Tartaglia is great. There’s some really detailed close-ups of Grievous that capture the spooky nature of the droid with living eyes. The shots at the end with him standing above the forest at sunset are gorgeous, and throughout the issue, the art is solid. Whether showing him scuffling about and climbing, or posing with his lightsabers, all the panels did a great job of bringing him to life. And the story gives them a good variety of panels to play with. While we don’t get a ton on the cyborg’s backstory, we get a few glimpses of what he was like, and what he’s become. But the story shares the spotlight with the Force in showing how it’s eternal, or at least really hard to extinguish. Grievous might be able to augment himself to be able to kill Jedi, and he might have starships that can wipe out Jedi temples from a distance, but there are parts of the Force he will never be able to understand or come close to having any dominion over. For that part, the story does a good job of giving us something entertaining but also thought provoking. With a good story and great artwork, I give General Grievous #1 a five out of five metal bikinis.